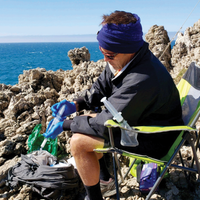 Researchers show that tagging marine animals could disrupt their ability to live normal lives. EUREKALERT, LUCY HAWKES, UNIVERSITY OF EXETERScientists use tracking devices and cameras to keep tabs on many marine animals—from sea turtles to humpback whales—in order to learn more about them. 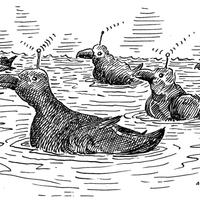 It is known that such technology can disrupt typical animal behavior, but existing recommendations for aquatic subjects are based on how tagging affects air travel for birds, which is a poor comparison for most aquatic species. 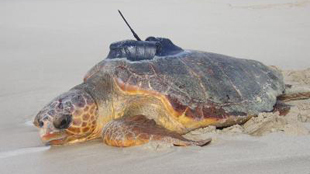 Research published in Methods in Ecology and Evolution this week (October 31) presents evidence that tracking devices likely have negative impacts on marine animals, especially smaller ones. The research team, based at the University of British Columbia and the National Oceanic and Atmospheric Administration (NOAA), created 11 fiberglass models of four sea turtle species, each of which they put into a wind tunnel. The researchers measured drag on the models both with and without tracking devices attached. They used the data generated in the wind tunnel to generate models to estimate the drag of different sizes of tags and its potential impact on velocity, energy, and behavior of different species and sizes of turtles and other aquatic animals. They suggested that tagged large animals likely only have slight increases in drag that would have negligible effects on their behavior. But tagging smaller animals could increase drag much more, causing them to expend more energy to swim or decrease their velocity, which in turn could disrupt migration, feeding, and mating.